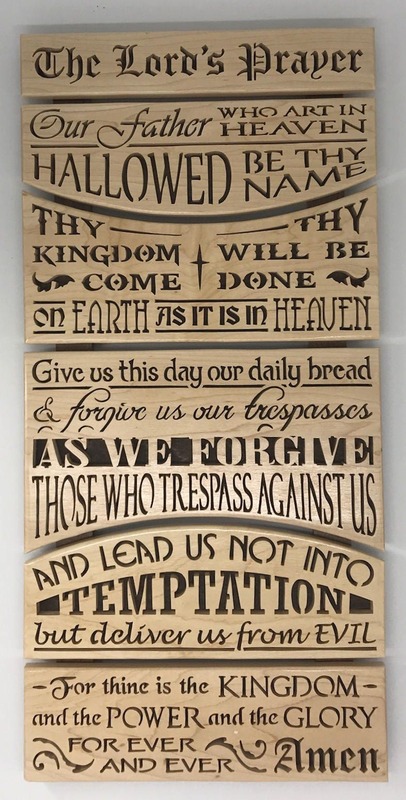 This beautiful scroll saw plaque sets the Lord's Prayer on separate panels, which are attached to runners on the reverse side. The panels are made of 1/2" maple with 1/8" Baltic birch plywood backers dyed walnut. The two runners are made of solid walnut. As can be seen, part of the beauty of this plaque are the various fonts used with the different petitions. All the lettering is hand cut using a scroll saw. The panels are 12" in width and the entire plaque is 25" in height. This item is made to order. Please allow 2-3 weeks from ordering to shipping. If you are interested in having it made in a different wood, please contact me for pricing. Please note that I offer free domestic shipping on this item. The pattern is from Sheila Landry Designs.